I was invited to a potluck dinner party last weekend, and my job was to bring the appetizer. I was desperately trying to figure out what to bring when I remembered a recent post on fromage fort from one of my favorite cooking sites, Smitten Kitchen. Fromage fort is the perfect contribution for the budget conscious guest. 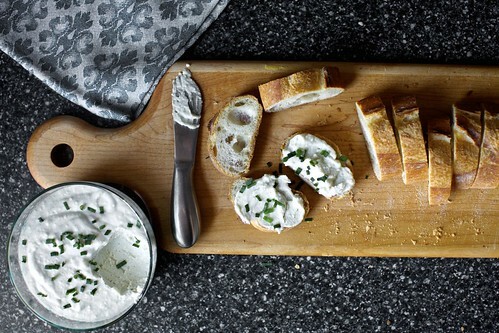 It basically takes left over cheese, mixes it together with wine and herbs, and makes it into a soft cheese pate. 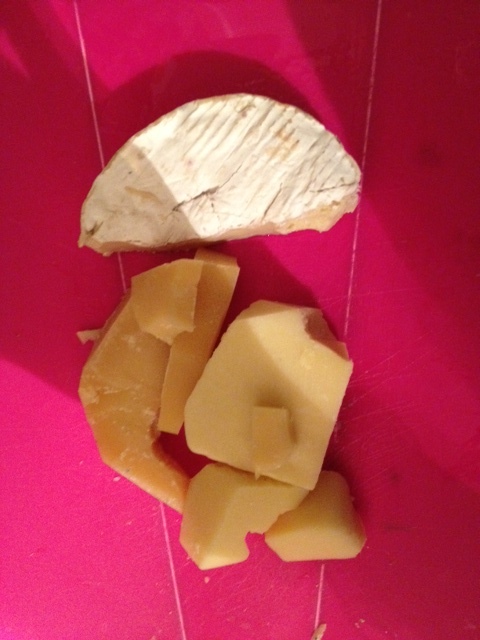 Depending on which cheese you use, it could taste slightly different each time. But, trust me, it is always yummy. I used leftover brie, emmentaler, and parrano that I found floating around in the back of my fridge. This is what it looked like in the beginning. On my way home from work, I stopped at my favorite local shop, Stachowski’s to get some fresh herbs. The owner didn’t have any out, but when I asked, he nicely gave me some from the back. FOR FREE. God, I love that place. I swear if they served coffee on weekend mornings, I would be there all the time. Anyway, I used the grater attachment in my cuisinart to grate the hard cheese, and then cubed the soft cheese and added it in. I dumped in some fresh Stachowski’s thyme and minced garlic, hit pulse, and drizzled white wine through the feed tube until it meshed together into a consistency I liked. Blend cheese, butter, and garlic in food processor until combined. Add the wine through the feed tube with the motor running until you get a smooth consistency, but it’s not too liquid. Add herbs and sherry and pulse until just combined. Season to taste with salt and pepper. Not only was the final result delicious and inexpensive, but it looked fancy and made a lot. I gave half to my mom for a dinner party she went to on Sunday night, and we both had leftovers! Yum! Such a great idea! Super idea! I have used end pieces of difference kinds of cheese to do this – just add white wine and garlic and whip it up in your food processor! Yum . . . .
I’ve never heard of this but it. is. genius! What an excellent use for randoms!